Single Substrate Sputter Equipment STP-1650 | SCREEN Finetech Solutions Co., Ltd. The linear ion source incorporated into this system releases high-energy ions to clean the substrate, ensuring a high level of adhesion. Two dual cylindrical cathodes are featured, creating stable coating at high speed and with a high level of quality. A usage efficiency of at least 70% is achieved for the target. Multiple filaments enable a uniform, high-quality AF coating that is highly durable and water-resistant, since there is no absorption in the visible light spectrum. The STP-1650 features a drum that spins at high speeds (up to 100 rpm) to ensure a highly uniform coating. An inverter type panel is used to hold the sample, which faces the sample towards the sputter source on the outside of the drum and the thermal vapor deposition source on the inside of the drum. 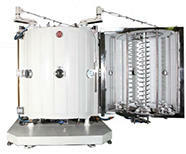 This allows for a continuous process for AR and AF coatings using only one drum. 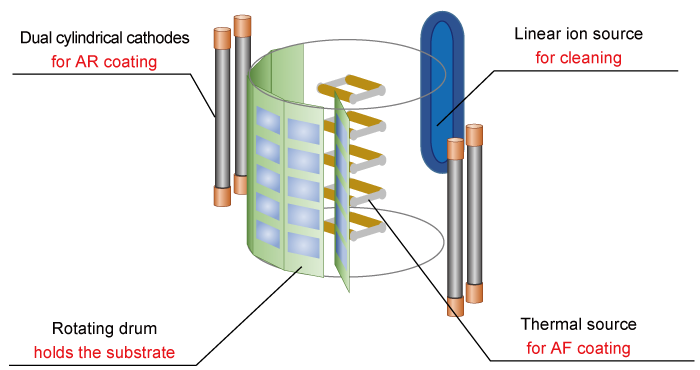 Up to six cathodes can be provided. Optimal for high-speed coating and layering. Features both a thermal vapor deposition source for AR coating and a sputter source for adhesive layers. Optimal for coating of anti-fingerprint materials on smartphones and many other kinds of displays. Features both an arc vapor deposition source and a sputter source. Optimal for decorating or creating hard coating on ceramics, plastics and metals.